Being from the South, snow-sports is not something we get to take part of that frequently. 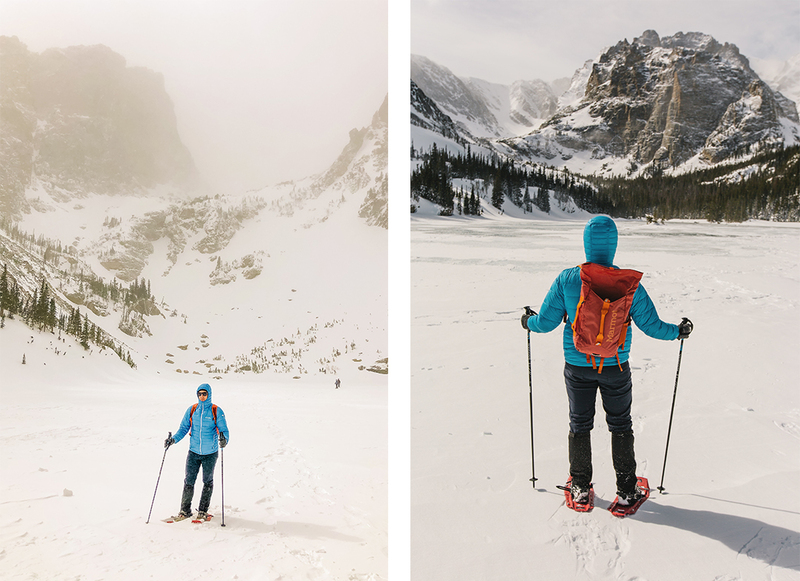 But for a long time now we've wanted to try snowshoeing - something about traversing the white powder without sinking knee deep seemed like an amazing way to experience the backcountry. We set out to Estes Park, a small mountain town located right at the entrance of Rocky Mountain National Park. 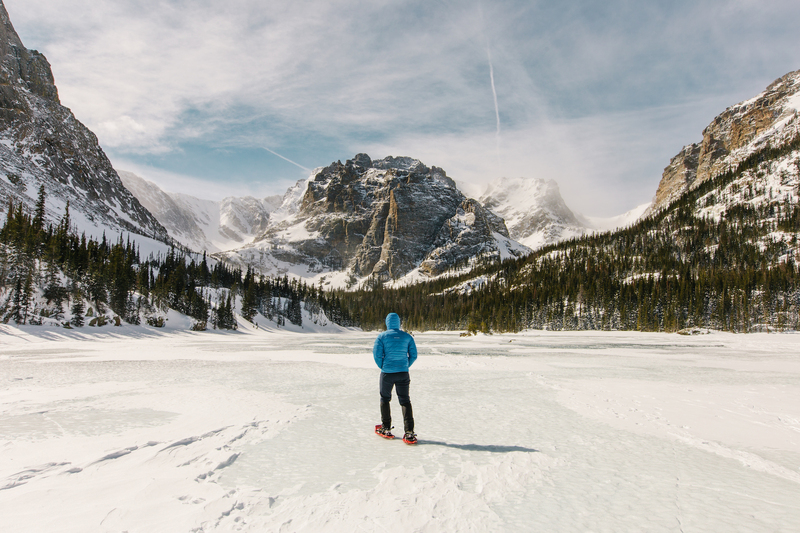 This park is open year-round and experiences a fraction of the tourist pressure in winter than it does in summer. It’s also the direction to go if you want to avoid the ski traffic. Win win. 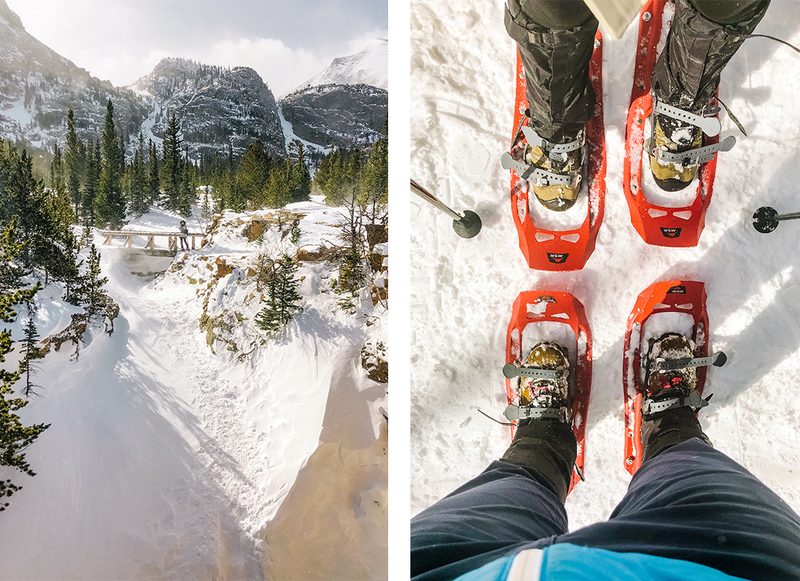 Snowshoes can be rented for 5$/pair at Estes Park Mountain Shop. Check out their bargain basement for garage-sale prices on some pretty sweet gear! Grab a donut from Donut Haus on your way to the park entrance. Be sure to go before 10 AM or they may sell out. And, always get their special donut of the day. Lastly, get your morning joe from Coffee on the Rocks. 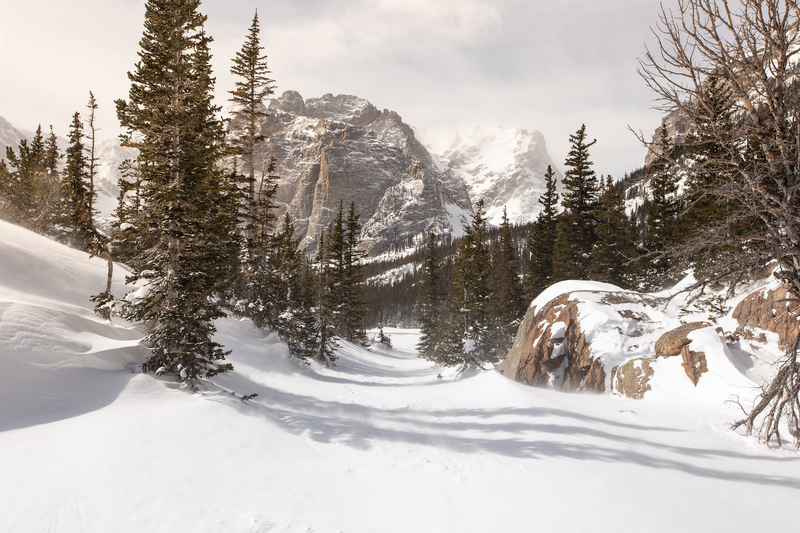 RMNP typically keeps the road clear to Bear Lake and Glacier Gorge. Glacier Gorge will fill up by 10:00 am on weekends, but there’s almost always parking at Bear Lake. 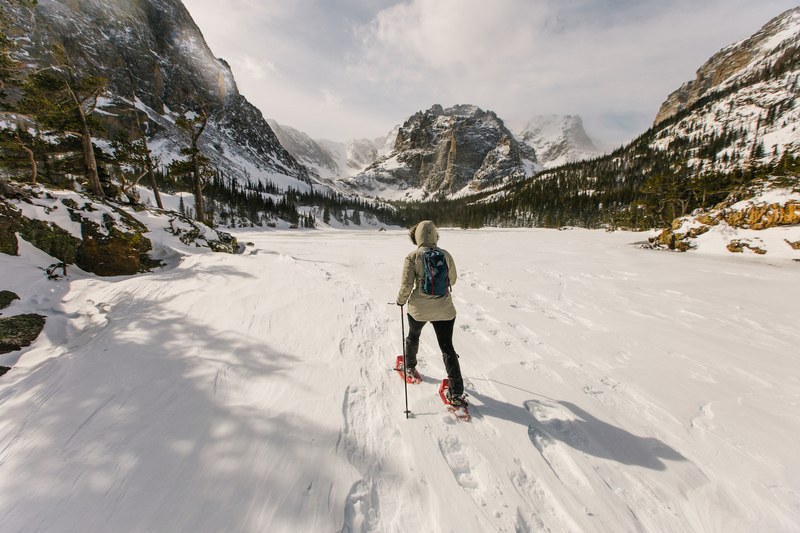 Both are great starting points for backcountry snowshoeing to any of the subalpine lakes on the map. We were able to see Emerald Lake, Dream Lake, Nymph Lake, and Loch Vale (Loch Vale was our favorite). Windproof, insulated jacket. Emphasis on the windproof! Be prepared to eat while you’re walking. Stopping for too long and sitting down in the snow may allow your core body temperature to drop. Movement is your best way to keep warm. We crushed some leftover pizza (highly recommended), but any pre-made sandwich, bagel, granola bar will do. Also don’t forget to stay hydrated. When you’re not sweating, it’s easy to forget to keep drinking water. 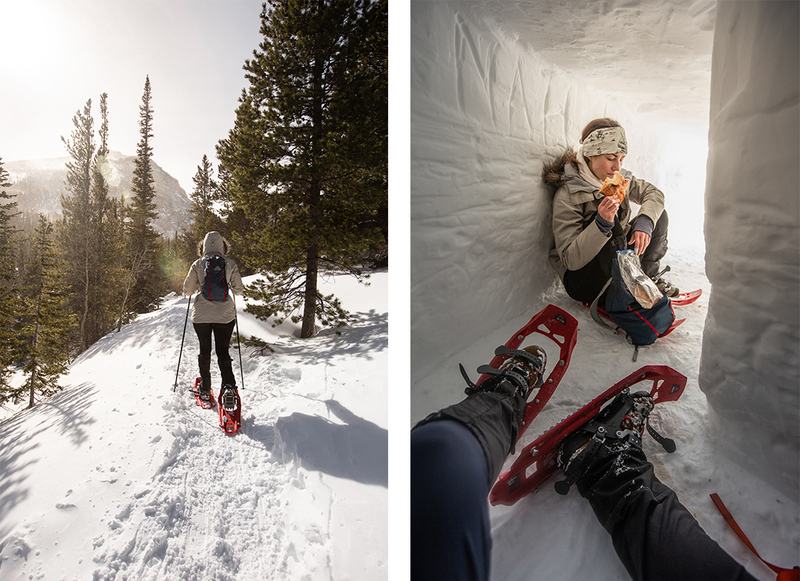 Outdoor adventure perfected! These photos are astounding!